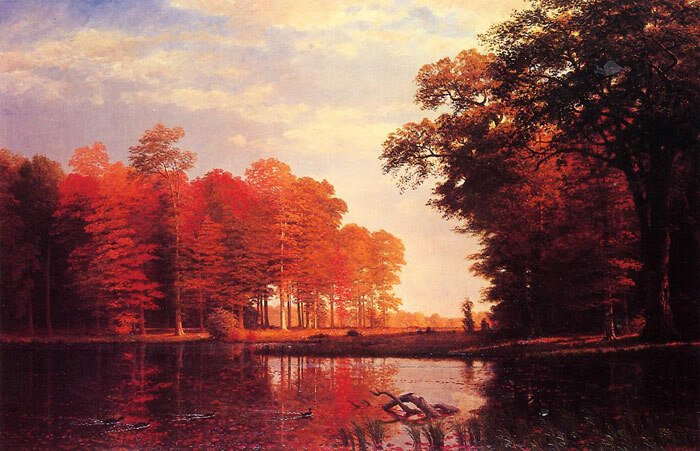 Bierstadt returned to the theme of the woods in Autumn Woods , which was entitled Autumn Woodland in a 1929 inventory of the Haggin Collection. It communicates a mood of quiet melancholy unusual for Bierstadt, and it is hard to resist the speculation that this undated work and Autumn DogWood of 1886 (in the New-York Historical Society, New York City) reflect the artist's reaction to growing older as well as to suffering professional setbacks and the loss by fire of his country estate, Malkasten, in Irvington, New York. SPECIAL NOTE : The painter will make the reproduction as close to the original oil painting as possible. If you want your painting to alter from this likeness, please email us and " Autumn Woods , 1886	" will be reproduced according to your special requirements.